When it rains, it pours. And in the environmental movement, it’s a torrential downpour of idiocy! With the recent Climategate and Glaciergate scandals, the so-called science of global warming has been rapidly crumbling into oblivion faster than anyone could have ever hoped for. The head of the IPCC has been called out for being just as fraudulent as Al Gore’s claims. Scientists and media have been demanding his resignation and the public is quickly realizing the climate change farce. But somehow, a few stubborn eco-terrorists are still making their crazy claims. It was bad enough that someone actually blamed global warming for the Haiti earthquake, and now we have an even better funny farm minute for the 2010 Olympics. Here in the one Canadian city famous for warm winters we are about to begin the Winter Games. There is little snow on Cypress Mountain, which happens every few years normally. I know, I worked there for years. The mountain is less than 20 minutes from Vancouver beaches. Warm? Huh? It’s not rocket climate science. So of course, all we really wanted now was for some anti-carbon scaremonger to blame it all on alleged global warming. 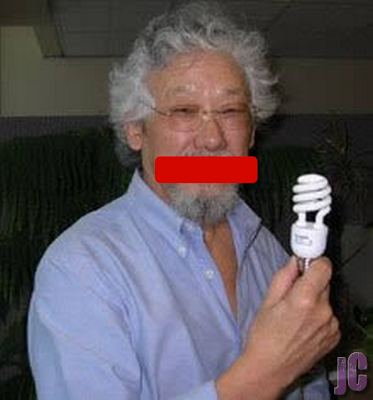 David Suzuki, the local rabid hippie totalitarian hasn’t gotten the memo that blaming everything on global warming is so 2009, and beclowns himself trying to hijack the Olympics to the global warming hoax. Thankfully the people aren’t buying his garbage anymore. Every time Suzuki’s articles are published online, hundreds of readers leave their comments, and very few of them are kind to the senile old hippie. Meteorologists predicted last July that El Nino was coming and that warm weather would hit us in January and February of this year. Mr. Suzuki, you claim to be a scientist, so please don’t tell me you’ve never heard of El Nino, the natural weather pattern that circulates warm air from Hawaii up to the Canadian west coast? Or the fact that 30 years ago there was NO snow on the local mountains for most of the season and Vancouver’s Grouse Mountain went bankrupt? Perhaps you were too stoned at the time to remember that. Clearly you still haven’t quit smoking it either. And how come you conveniently brush off the fact that the rest of the entire top half of planet earth is currently experiencing the coldest winter in a century? Your press releases claim that the coldness everywhere else is a result of “local weather patterns, not climate”. So how come when we get a WARM spell in one area – Vancouver – you suddenly blame it on “global climate change”, and not local weather??? LMFAO. How convenient. You and your foundation are hilariously stupid. Your attempts at fear mongering for support and funding are absolutely disgusting. And you also ignore the fact that average global temperatures are dropping and have been dropping for a decade. Oh that’s right, I forgot. Global cooling is also because of global warming. And CO2 aka plant food is poison. OMG UNPLUG YOUR CELLPHONE CHARGERS! DESTROY YOUR CARS! WE MUST ALL CHANGE OUR LIFESTYLES, PAY GREEN TAXES, AND WRECK THE ECONOMY BEFORE WE MELT AWAY!!!1! !1!